Lee Cohen story and photo. Click photo for larger view. A large group of PTA delegates from Kaegebein, Huth, Connor Middle School and the high school attended the annual Niagara Region PTA Partnership Dinner last week. Joining them were Superintendent of Schools Brian Graham and school board president Ashli Dreher. Delegates heard keynote speaker Natalie Beilein, co-founder and principal of Your End Game and executive director of the Isiah-61 Project, present a program on "Redefining Genius." Lee Cohen story and photo. PTA president Jennifer Walowitz described Sarah Russo as going the extra mile to help her students grow as musicians and to teach them life lessons along the way. "Her impact can be seen in band, jazz band, lessons, and extracurricular activities. She is patient and understanding with her 6th-grade band students. She gives them time to put their instruments away before the bell rings. 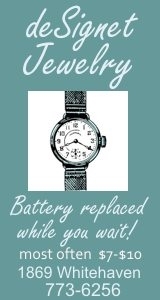 This gesture eases their anxiety about getting to their next class on time and helps them transition to middle school. " Every fall Mrs. Russo and Mr. Boron produce and direct the middle school musical. Students get to experience an audition, and everyone gets a chance to perform in the musical. In addition to rehearsals, Mrs. Russo devotes countless hours behind the scenes working on costumes and sets. It’s amazing to see the show come together in just five weeks. Plus, students work as a team and gain confidence in the process. In December Mrs. Russo works with every student to record a holiday CD. She borrows recording equipment, coordinates background accompaniment, and schedules after-school recording sessions. Because of her efforts families get a special keepsake CD of their child’s music. In the spring she coordinates a chamber concert with Mr. Ells. The 6th-grade musicians perform in small groups. Mrs. Russo takes time to choose the right music for each band group, coordinate instrument lessons, and arrange the background music. Before the concert Mrs. Russo explains this experience is new and scary for students. She helps them realize that they can be terrified and still be able to perform. Mrs. Russo gently challenges our kids to go outside of their comfort zones and shows them that everything will be okay. 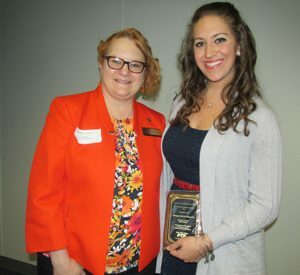 Throughout the year Sarah Russo dedicates so much time and effort to give students a chance to shine. Her impact extends beyond music into life. 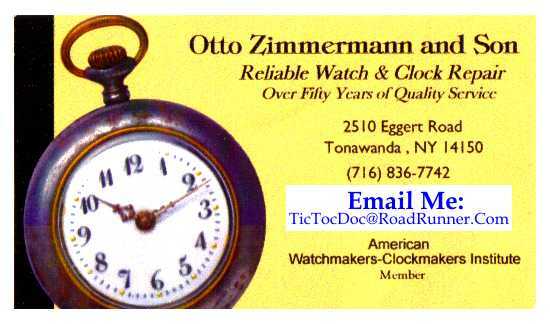 She deserves to be recognized with a NYS PTA Honorary Life Award. 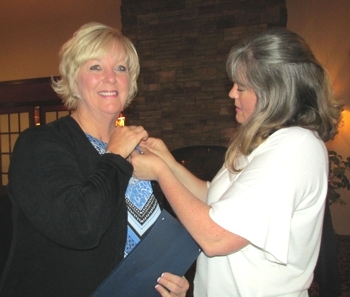 Cindy Sharpe (left) receives the PTA Distinguished Service award pin from Trish Eichel, PTSA president. 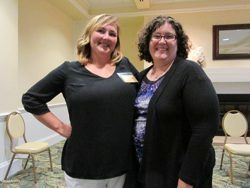 Recently, RN Cindy Sharpe, was the recipient of a PTA Distinguished Service Award, presented by Trish Eichel, high school PTSA president, at the PTA Council Installation of Officers dinner at Ellden's at River Oaks. The award, given only to those who have already earned a NYS PTA Honorary Life Membership, is presented in recognition of exemplary service and leadership on behalf of children and youth. Sharpe has been a Grand Island school nurse for more than 30 years and during that time she has also been an integral part of PTA. While at the high school she has chaired the scholarship committee, organized and run the student awards assembly, run contests to promote faculty membership in PTSA, organized and chaired school board Candidates' Night, served as PTSA president, served as a liaison between the PTSA and administration, and generally gone far beyond her duties as a nurse to help promote the safety and welfare of the children she cares for. Cindy is hanging up her Grand Island nurse's cap in July and she will be very much missed by a grateful school community. Lee Cohen story and photos. Two Grand Islanders were winners in the Niagara Region PTA annual spelling bee for 4th and 5th graders. 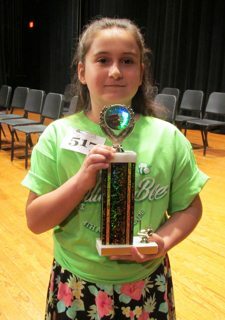 Huth Road student Gianna Caruana received the first-place trophy in the 5th grade spell-off, and Kaegebein student Preston Pickard earned the third-place trophy in the 4th-grade contest. 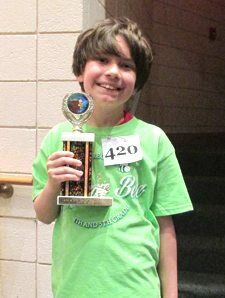 In each school the top-three winners in grades 4 and 5 went on to the Region spell-off, held in Lyndonville last Saturday, May 19th. Students from 13 different Niagara Region elementary schools attended the spell-off. Participating were 4th graders Carl Beckley, Simran Gill and Aubrey Peterson from Huth, and Preston Pickard, Betty Smith and Jeremiah Zherebilov from Kaebegein. Fifth graders from Kaegebein were Lorelei Popp, Drew Birtz. Giana Caruana, Cora Pankow, Hailey Green and Alyssa Pizur represented Huth. From left: Bonnie Nevans, Cindy Ames, Jennifer Walowitz, NYS PTA President Gracemarie Rozea, Sara Sander, Jessica Mallabar. Also attending, not pictured: Sheila Richards, Lee Cohen. Almost 400 delegates met in Niagara Falls November 3-5, 2017 for the 121st NYS PTA annual convention. They set PTA policy, guiding advocacy and the organization's focus, by voting on resolutions and discussing critical issues facing the state's children, families and educators. 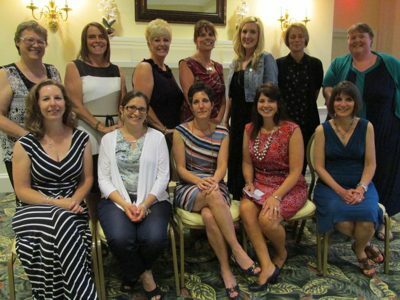 "Every year, dedicated PTA members convene to renew PTA's vision and mission for children and education," said PTA state president Gracemarie Rozea. She noted that nearly one-third of those in attendance were first-timers, "recognizing the important and critical work PTA members accomplish each and every day in support for children, families and educators." National PTA past president Chuck Saylors, in his keynote speech, highlighted the role ot PTA in advocacy, family engagement and programs for children. In a fireside chat Education commissioner MaryEllen Elia, together with Laura Feijoo, president of the NYS Council of School Superintendents, NYS PTA president Gracemarie Rozea, and executive director Kyle Belokopitsky covered a number of topics, including new federal laws, testing, standards and assessments, family engagement and supports for children. Amy Hysick, the 2017 NYS Teacher of the Year, from the North Syracuse Central School District, shared her inspirational story and passion for teaching, discussing how student motivation can be supported, and urging increased engagement in education on all levels. Delegates discussed and voted on resolution retentions, updates and rescissions to policy, in addition to attending numerous workshops. Topics included diversity, school funding, STEAM education, bias in leadership, sexting and texting, the effect of federal and state education policies on communities, the ADHD mind, male engagement, bullying and school safety, and current issues in education. "Annual convention is a time when NYS PTA members can speak with one voice in supporting children," 1st vice president Judy Van Haaren explained. "Delegates will return to their local PTAs better equipped to help shape the future of education and support for our children." 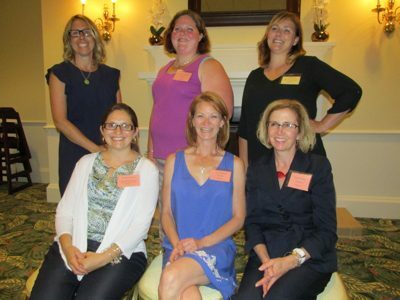 PTA Council delegates (from left): Barb Swagler, (HSPTSA); Cherie Kucinski, (Kaegebein), recording secretary; Julie Scott (Sidway), vice president; Katie Slaiman (Sidway); Sarah Sander (Connor Middle); Cyndy Montana (Kaegebein/Connor Middle), president; Tracey Kozlowski (HSPSTA), treasurer. Absent: Holly Fratello (Huth), corresponding secretary; Erin Pankow (Huth). 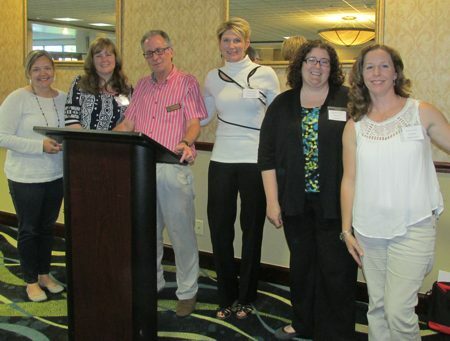 Niagara Region PTA director David Steggles with newly installed PTA presidents. From left: Bonnie Nevans, Huth; Trish Eichel, HSPTSA; Steggles; Cyndy Montana, PTA Council; Christie Lesser; Kaegebein; Kristen Thore, Connor Middle School. 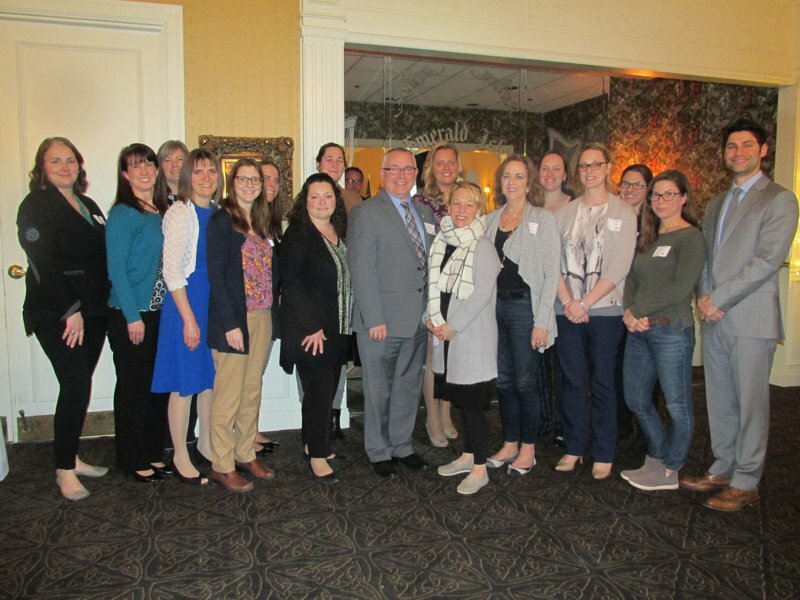 Niagara Region PTA director David Steggles installed the 2016-17 officers of the Grand Island schools at the annual PTA Council dinner, held at the Radisson Hotel. Superintendent of Schools Brian Graham also attended the dinner and greeted the new officers and PTA board members. 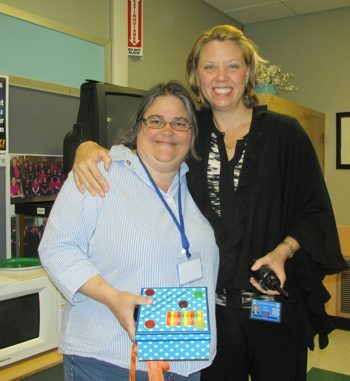 From left: Esta Shuerholz with Huth Road principal Kerri Nowak. Esta Shuerholz is the recipient of a PTA Honorary Life membership from Huth Road PTA. She was recognized for her dedication to making Huth a fantastic place to learn. Even though her children no longer attend the school, she comes into the office every week to make copies for the teachers, thus providing a time-savings gift for teachers so that they may spend more time with students. Without complaint she can be relied upon to be quick, efficient and correct in her volunteer activities. The staff is truly thankful for her presence and felt that she was richly deserving of the award. 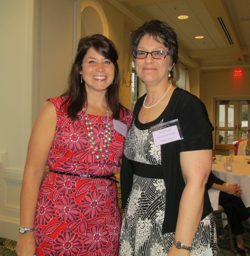 Superintendent of Schools Teresa Lawrence (left) with PTA Council president Lisa Fabiano. 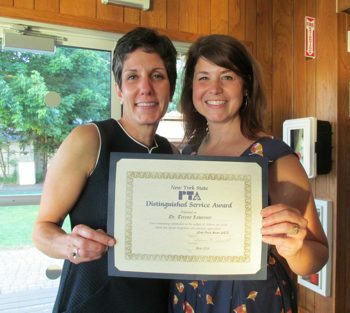 Dr. Teresa Lawrence has received the PTA Distinguished Service Award, presented by PTA Council president Lisa Fabiano. The award honors those who have shown exceptional dedication or who have made an outstanding contribution to the welfare of children and youth. Fabiano commended Lawrence for her dedication to her job. "She works really hard; let's face it; it's tough to be 'boss'. She has to make the hardest decisions and unpopular choices, work long hours, attend a zillion meetings, and try to keep everyone happy. We thank her for having given 100% to the Grand Island schools in her short time here." A parent information night will be held in the High School Auditorium, 1100 Ransom Road on Tuesday, March 15th at 7:00 p.m. about recognizing anxiety in our children. This is a community wide event, and an opportunity to educate yourself on understanding anxiety in our children including the emotional and physical reactions to it. Learn about how it can lead to low self-esteem, eating disorders, self-injury, drug use, depression, and even suicide. You can develop plans for effective coping, and creating common ground by talking about the issues, not hiding them. The presentation will be held from 7:00 - 8:30pm by the Ken-Ton Family Support Center and the Suicide Prevention Coalition, and is sponsored by the Grand Island PTA Council. With your support, your child can manage daily anxiety and stress. For more information see flyer. 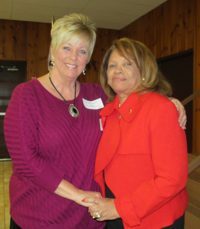 Above, from left: Cynthia Sharpe, HS PTSA president and district nurse team leader with Dr. Catherine Fisher Collins, Board of Regents trustee for WNY. Grand Island representatives at PTA Partnership dinner. Front row (from left): Jennifer Walowitz, Huth PTA president; Kristen Thore, MS PTA president; Cynthia Sharpe, HS PTSA president; Crystal Still, Sidway PTA president. Back (from left)} Kerri Nowak, Huth Road principal; Kat Estrella, Huth; Sarah Sander, Middle School; Denise Dunbar, Sidway principal; Mike Carter, HS assistant principal; Christina Iraci, Sidway; Lisa Fabiano, PTA Council president; Lee Cohen; Dr. John McKenna, president, School Administrators Association of New York State (SAANYS). 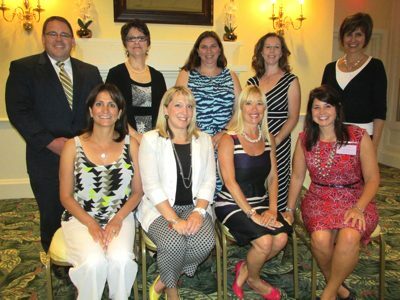 Grand Island was well represented at Niagara Region PTA's annual Partnership Dinner, held last week in Lockport. The dinner celebrates the partnership between parents and school officials, cooperating for the betterment of children. The program also celebrated PTA Founders Day in recognition of the establishment of PTA 119 years ago. Board of Regents member Catherine Fisher Collins was the keynote speaker at the dinner, representing the 8th Judicial District of Western New York. Dr. Collins stressed the importance of family involvement in children's education. "When families are engaged, children succeed," she said. She would like to see the establishment of an office of parent and community involvement. She noted that the state did not use common sense in the implementation of the Common Core, establishing it across all grades, instead of phasing it in. She urged "planning with you, not for you." Commenting on the three-year moratorium regarding evaluations, Dr. Collins said that the laws need changing or "We'll be back where we started. "In response to a question regarding the Op-Out movement, she stated parents had the right to refuse to have a child take the state tests, but she added, "Students in my college classes do not have that right. They must take the tests." The annual PTA Partnership Dinner program celebrates PTA Founders Day, an annual February event, this year acknowledging the establishment of PTA 119 years ago, with a skit honoring founders Phoebe Apperson Hearst, Alice McLellan Burney and Selena Sloan Butler. The dinner also recognizes the partnership between school officials and parents. Awards were presented to several PTA members. 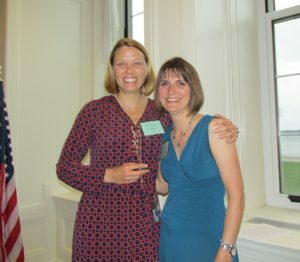 Christine Kennedy of Middleport, received PTA's highest honor, the National PTA Life Achievement Award; Becky Wilson of Lockport, the NYS PTA Honorary Life Membership Award. 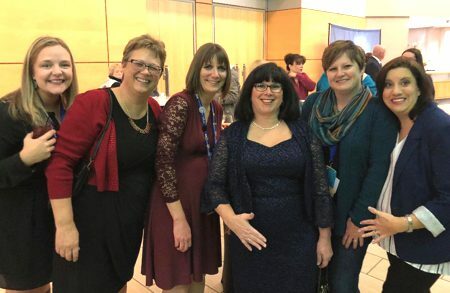 From left: Crystal Still, Sidway president; Kristen Thore, Connor Middle president; Sarah Sander, Connor Middle chairperson; Bonnie Nevans, Huth secretary; Jennifer Walowitz, Huth president. Lee Cohen story and picture. 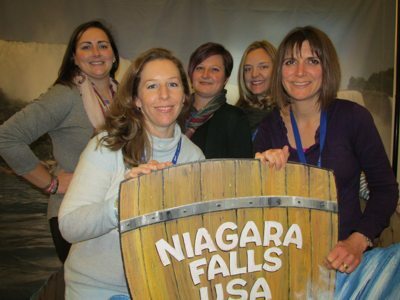 Six Grand Islanders were among more than 320 delegates to attend the New York State PTA's 119th annual convention, held in Niagara Falls last weekend. MaryEllen Elia, commissioner of education and president of the University of the State of New York, was the keynote speaker Friday night. She discussed educational reform initiatives under review in relation to assessments, standards and multiple pathways to graduation and later answered questions from delegates. Ashli Skura Dreher, 2104 NYS Teacher of the Year and a Grand Island resident, also spoke, sharing her own story and her passion and joy in teaching. Nathan Monell, National PTA executive director, was keynote speaker at the Saturday banquet. Bonnie Russell, NYS PTA president, said that "Every year, the state convention re-energizes and renews PTA's vision and mission for children and education." 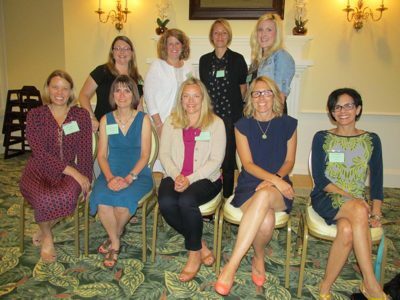 She noted that nearly one-third of delegates were first-timers, "signifying both a recognition of the relevance of the work PTA volunteers do as the premier advocacy association for children and families." NYS PTA represents more than 300,000 members in more than 1400 schools statewide. It focuses on issues related to the health, education and welfare of all children. Delegates met to learn about current issues in education, networked to share best practices and heard experts and inspirational speakers. They voted on updates to previous resolutions, on retention on other resolutions, as on a new resolution, dealing with the use of bio-solids in New York. 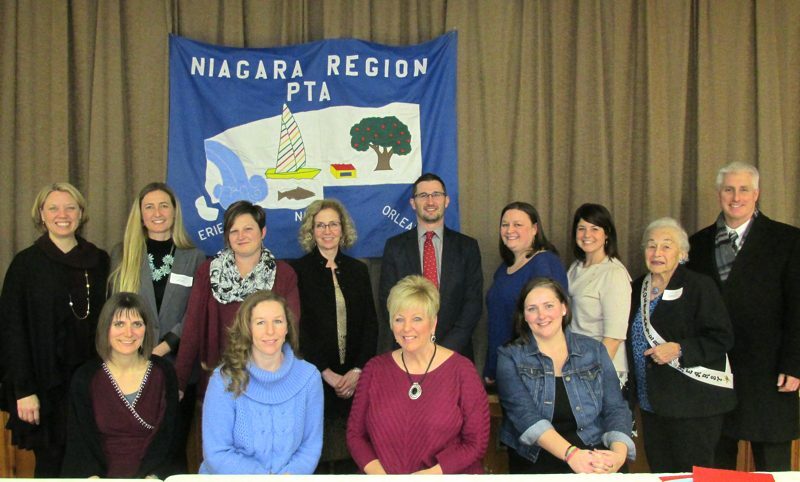 The resolution was successfully sponsored by Niagara Region PTA, of which Grand Island is a member. Grand Island PTA Council: Front L to R: Kristen Thore (Connor Middle co-president); Shandra Gallegos, corresponding secretary (Sidway); Dr. Teresa Lawrence, superintendent of schools; Lisa Fabiano, president (Connor Middle); Jen Walowitz (Huth president). 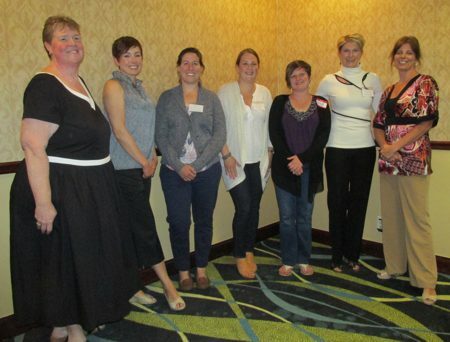 Back L to R: Cindy Ames, Niagara Region PTA director; Sue Marston, school board liaison; Cindy Sharpe (high school); Tracey Koslowski, treasurer (high school); Erin Pankow (Huth); Holly Fratello, vice president (Huth); Barb Swagler (high school). Absent: Cheri Kucinski, recording secretary (Kaegebein); Andrea Mango (Sidway); Kathy Chadwick (Kaegebein); Maura Rustowicz (Connor Middle); Cyndy Montana (Kaegebein); Betsy Cali (Connor Middle co-president). High School PTSA: Front L-R: Bernice Schoener, treasurer; Allyson Schoener, co-corresponding secretary; Eva Bobeck, co-corresponding secretary; Trish Eichel, secretary. Back L-R: Barb Swagler, Council representative; Tracey Kozlowski, Council representative; Kim Tetreault, 1st VP; Dan Quartley principal; Cindy Sharpe, president; Fahim Mojowala, 2nd VP. Connor Middle School: Front L to R: Annmarie Vanini, treasurer; Dorothy Garcia, VP programs; Tammy Von Wraza Ras, VP programs; Lisa Fabiano, Council representative; Back L to R: John Fitzpatrick, principal; Sandra Cohen, recording secretary; Sarah Coutu, VP membership; Kristen Thore, co-president; Ann Bobeck, corresponding secretary. Absent: Betsy Cali, co-president; Mary Jane Fonte, VP membership; Maura Rustowicz, Council representative. Huth Road: Front L to R: Kerri Nowak, principal; Jennifer Walowitz, president; Bonnie Nevans, corresponding secretary; Lisa Pyc, Board of Education liaison; Paula Macrides, VP enrichment. Back L to R: Jennifer Corbett, VP enrichment; Amy McMann, VP membership; Holly Fratello, Council representative; Erin Pankow, Council representative. Absent: Sarah Wheeler, VP membership; Janet Tyski, treasurer; Aliza Seibert, recording secretary. Kaegebein From left: Crystal Still, recording secretary; Christie Lesser, ways & means; Absent: Cyndy Montana, president; Jen Kam and Ellen Lewis, VPs membership; Carol Pizur, VP programs; Nancy Burns, treasurer; Jessica Mallabar, corresponding secretary; Kathy Chadwick & Cherie Kucinski, Council representatives. Sidway PTA: Front L to R: Shandra Gallegos, Council representative; Patricia Gagliardo, treasurer; Denise Dunbar, principal. Back L to R: Lisa Pyc, school board liaison; Elisa Carrig, president; Crystal Still, VP membership & direct donations. Absent: Krista McNulty and Marlene Beck, co-VPs programs; Melissa Graeff, recording secretary; Jessica Mallabar, corresponding secretary; Andrea Mango, Council representative. The PTA Honorary Life Membership Award honors individuals who show exceptional dedication or who have made an outstanding contribution to the welfare of children through school, business, community, or home. Mary Jane Fonte is this year's nominee. She has served the children of Grand Island through school, business clubs, community, and her home. She is often described as helpful, positive, kind, energetic, and gracious. She is so gracious, in fact, that if you try to thank her with a gift, gesture, or card, she will write YOU a thank-you note! Her infectious positive energy just makes you want to participate. She continually models kindness, good manners, and general good citizenship for everyone she encounters, not just her students. She has organized many charitable events, including a winter-coat drive with her daughter and providing Christmas gifts for the less fortunate. Not surprisingly, she chairs the junior DECA organization at the middle school. She leads this group of self-starters and hard workers while fostering a philanthropic attitude. Her open and giving heart is exemplified through her seemingly never-ending donation of time. She encourages everyone who comes in contact with her. She is a huge positive force at VCMS and most definitely deserves The PTA Honorary Life Membership Award. Jack Burns was the recipient of a PTA Distinguished Service Award, presented jointly by PTA Council, the high school PTSA and Connor Middle School PTA. The award is given to someone who has already received a PTA Honorary Life Membership, and who has given exemplary service and made outstanding contributions to the welfare of children and youth. Burns, director of transportation for 33 years, was dedicated to ensuring the safety and security of the children who road his buses every school day. 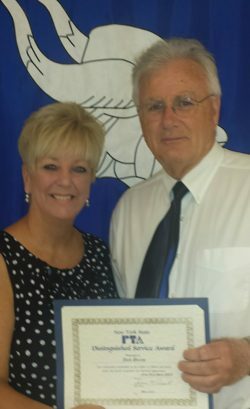 Cindy Sharpe, PTSA president, presented the certificate and Distinguished Service pin at the school district's retirement reception. Each year PTA presents an Honorary Life Membership Award to those members of the community, school or PTA who show exceptional dedication or who have made an outstanding contribution to the welfare of children and/or youth. This service may be through the home, school, business or community. Individuals should exhibit sensitivity to children and their needs. They may be found in any area of our community. PTA Council president Lisa Fabiano presented the award at the Council installation dinner to Sandra Cohen. She explained that a few years ago she became very active in PTA and was always looking for helpers. "I jotted down a little 'Go-to Girls' list, something to look to when desperate for help and know that I can ALWAYS count on getting a 'Sure, I can do that' answer. The list has changed over the years, but it now includes Sandy Cohen. All I had to do was send her an email or a quick phone call and I knew she would help. I like to call Sandy a 'quiet volunteer.' You will never find her griping about making another baked good, or complaining about working an event, or grumbling about another meeting. She is there! This year I arrived at the Huth bazaar and there was Sandy - working the Cake-Walk all night. She never left the room! I didn’t know she was working that event...because she is quiet about it. Always willing to help but never announcing it. 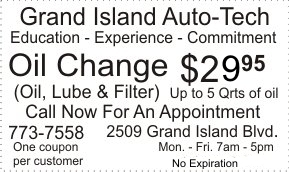 I wonder if Sandy knows how valuable she is to the Grand Island schools? I wonder if Sandy knows how much she is appreciated? I wonder if Sandy knows that she is someone people can count on? Well – hopefully with this award, now she does. Thank you, Sandy, for everything you do for our students, our schools, our PTA programs and events! You are certainly deserving of a PTA Honorary Life Membership." 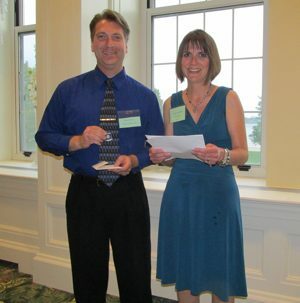 Honorary Life memberships were presented to AV technician Mark Gorton and Huth Road principal Kerri Nowak by Huth Road PTA at the PTA Installation dinner on June 10th. Huth Road PTA president Jennifer Walowitz, in presenting Mark Gorton's award noted that in addition to his numerous school responsibilities, has gone out of his way to preserve memories for Island families. He has recorded programs and activities both during school time and after hours throughout the district and made them available. Mark's dedication enhances the school experience for our children and provides lasting memories for families. Also honored was Huth Road principal Kerri Nowak, who has made the building a warm, welcoming environment. 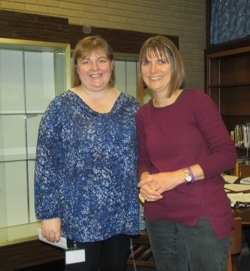 She has promoted family engagement, encouraged advice and input and welcomed volunteers. She models the Viking Values for her students and calls parents to share good news. She actively supports PTA and makes it a priority to be at meetings. It's clear that she cares about her students and their families and she is well-deserving of a New York State Honorary Life membership. NYS PTA president Bonnie Russell & Margaret Rustowicz. GIHS senior Margaret Rustowicz is the winner of the Niagara Region PTA Youth Humanitarian Award, given in memory of Stanly Marcus. The award is presented annually to a secondary-school student who best exemplifies, through volunteerism, the humanitarian principles of Marcus, who died in 1977 while serving as third vice-president of the NYS PTA. Margaret was honored for her volunteerism in the PTA, at school, with her church and her community. Her numerous activities include tutoring, volunteering at PTA activities, serving as a cadet with the Grand Island Volunteer Fire Department, and as a play director at her church. Her name has been forwarded to the NYS PTA for consideration as the state winner of the award. From left: Elisa Carrig, Sidway; Janet Tyski, Huth; Crystal Still, Sidway; Jennifer Walowitz, Huth; Trish Gagliardo, Sidway; NYS PTA president Bonnie Russell; Margaret Rustowicz, GIHS; Maura Rustowicz and Sarah Sander, Connor Middle School. 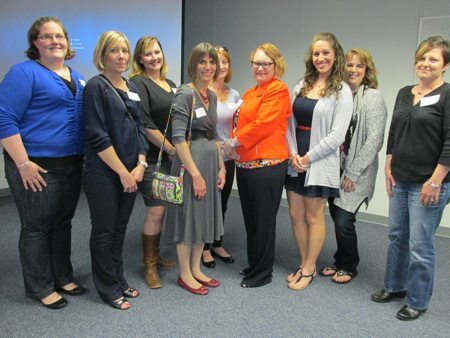 Grand Island PTA delegates attended the Niagara Region PTA's annual Spring Conference on Thursday, May 14th at the Niagara/Orleans BOCES Center in Sanborn. Following dinner delegates elected Niagara Region PTA officers, attended workshops, and recognized awardees. President Russell gave the keynote speech, encouraging delegates to continue their volunteer work on behalf of children and youth.